I might well do that. I basically hang out in front of Sugarcane Corner most of the time I'm online anyway, heh. You actually did help a bit. You did get most of them right though the riddle with the drip dropping fuzzy sound was by far the hardest. Ponies of Equestria! 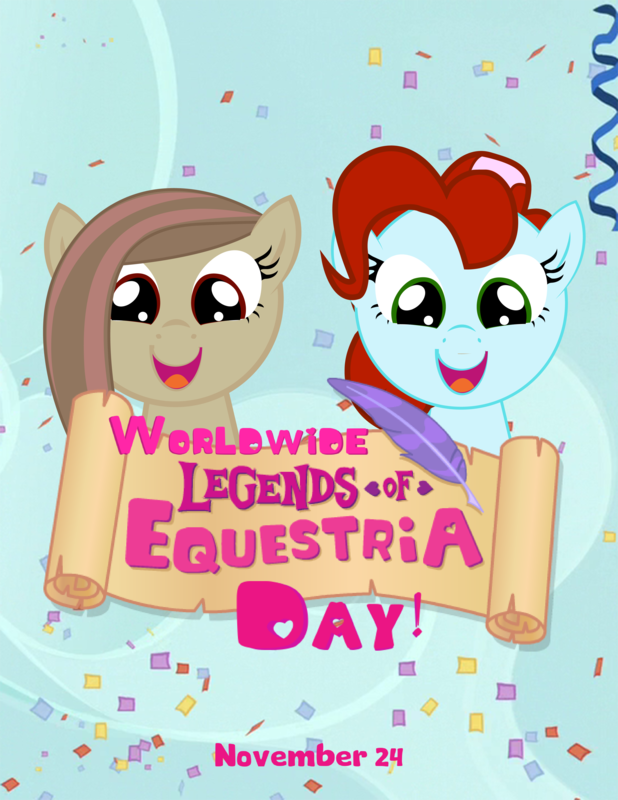 The time has come for a celebration of all the players who make Legends of Equestria a great place to be. On November 24, 2018 we will be hosting WorldWide LoE Day. This event will allow you, the ponies of Equestria, to tell your stories about your time in Equestria and what that has meant to you. It will also feature an exciting voting contest. Nominations have been taken for the following categories and now it is time to vote for your favorites in each category, with the winners receiving special honors at the event! So please vote now before November 24, so we can celebrate the ponies who make this place amazing! UPDATE: Lens Flare was kind enough to remake the polls so we could include write in votes because apparently Strawpoll requires you to log in with Facebook. Please use the link in his post below to vote! Thank you all so much! interesting. I notice that you yourself are not an option for any of these. Really, I don't know most of the people on these polls, so I voted for the ones I did know. Incidentally, where will this celebration take place? Sugarcane Corner? And at what time? This is a good point, thanks Frisktaker. I did forget that. I also had to fix the Best Artist poll, so anypony who voted earlier will have to revote on that on. The WorldWide LoE Day Celebration will take place at the Heartlands Ruined City Stage. The time will be announced later. And one more event to note! On November 11 at 11:30 PM GMT please come to the Cloudopolis Blimp area to help us in celebrating Old Autumn's Eve (based on the irl holiday St. Martin's Day). Bring a lantern/torch and some snacks to trade. We will parade through Cloudopolis and trade some treats with each other before having a nice party to end the evening. This is sure to be a fun event for all ages! I made a new poll on Google Forms (link below) so now ponies can choose "Other" without having to use their Facebook accounts. Ponies who have voted unfortunately have to vote again and those who haven't, I strongly encourage you to do so. Terribly sorry for the inconvenience. I hope to see you all at the event! Hey all. I know I've been spamming a lot of events lately, but I wanted to mention something because it would be really cool if any ponies who like roleplaying were able to come. I've been trying to get a more involved and active roleplaying community going on LoE for a while now, with a more action oriented focus. As I know we have the Sweet & Elite Roleplay which is amazing and Toot Sweet does such a great job with but (and I have never been to one due to time constraints) from what I understand these are more often than not slice of life and very casual one time events that sometime have a little longer plot. So you've probably all heard of The Witchmaster by now and you might be sick of him. But if you're curious at all, there will be a very large RP event on Friday November 9th at 930PM CDT (230AM GMT) which will begin in Ponydale outside of SCC. It's sort of a 'season finale' type event. This is in no way an attempt to overshadow Sweet & Elite. Please help them celebrate their anniversary. These ponies have done so much for LoE and making it a fun place with an active community. actually, this is the first I have heard of The Witchmaster. That said, I tend to spend most of my online time sitting on a bench outside scc, so as long as I'm online at the time and in the right instance, I'll probably watch it and be very confused. The date/time of the RP event is subject to change now. Probably won't be tomorrow. I'll keep you updated when I know more. So a few updates on some things that are upcoming and you need to know about. First of all today starting at 5:30 PM CST/ 11:30 PM GMT there will be an event in Cantermore Fountain Plaza that is meant to be a celebration of the United States baseball all stars playing in Japan. There will be a parade, hide and seek, and some other fun events and snacks. This is brought to you by Sapphire Moonlight and Pegafilly Twilight. Please come and enjoy. Tomorrow, Friday at 5:00 PM CST/ 11:00 PM GMT will be the aforementioned season finale of The Witchmaster's Key. Come and enjoy. And Saturday, November 17th please join us in the Heartlands PVP zone for a fun event and party. If you want to know more about this event, please contact me via PM or on Discord. I'll have the time up very soon. Hey everypony. Got some big things coming up that I wanted to make you aware of. Tomorrow is Amareican Thanksgiving and while that's pretty exciting for some, there are many of our player base who either don't celebrate the day or don't have anypony to celebrate it with. So you are cordially invited to an Equestria Friendship gathering at the Ponydale Schoolhouse on Thursday November 22 at 10PM GMT/4PM CST to spend time with your pony family just hanging out and gathering to show each other that we care and that there is always a place for anypony who needs us. On Friday, November 23 there is a birthday party for Sunny Skies. Please gather at SCC at 9PM GMT. You won't want to miss out on this one. Sunny is a valued member of the community and is responsible for planning most of the Wonderbolts shows you see at events. This will be a very special birthday. And don't forget that Worldwide LoE Day is November 24. If you haven't voted in our polls yet, please do so at the link above. This event will take place at the Heartlands Stage at 8PM GMT (time subject to change). Please come and share/listen to stories about pony's adventures in LoE as we celebrate what we are thankful for most in this community. Also see the front page about the rebranding of this topic. I am not the only pony who plans and runs these events and it's important that the community recognize that. So from now on, I am part of an organization called P.O.N.I. LoE day celebration has been moved to 11pm GMT (3 hours later). I want to thank all of the participants in Worldwide LoE Day who showed up and told their stories and just spent the time in fellowship with other ponies. The event was a ton of fun and you all made my day. I'd like to post the top three places for our polls here. If you're curious how you or a friend of yours placed overall, please feel free to ask here or DM me or another member of PONI on Discord. Please take time to congratulate the winners if you see them. Now on to other things! Oddly enough this idea was pitched before the MLP Holiday Special aired. We just didn't have a name other than 'secret Santa'. But anyway, here's how this works. Ponies will be given the name of another pony who they need to get a gift for, any gift will do but you could always try to get to know the pony and get them something special that they will appreciate. 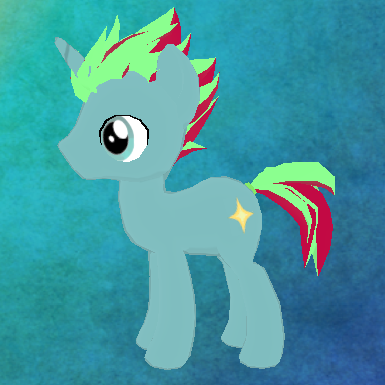 You can also trade names if you want but you can't reveal who you have to anypony. Near Hearthswarming we will have a party where we will exchange our gifts with one another. So what I need from everypony is to know if you want to participate in this so we can put your name in the pool. 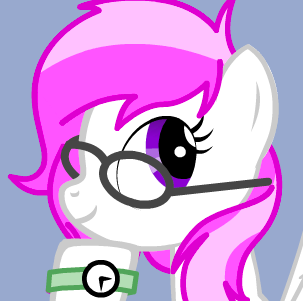 Then we'll randomly draw the names on December 15th and hand them out to everypony so they know who to buy a gift for. Let me or another member of PONI know here, on Discord, on any server I'm in, or in game. Thanks and I look forward to a fun holiday season with you. Oooh! I wanna participate! That being said I have a tendency to miss out on certain events because of irl reasons. Is there something I can do just in case I have to miss out gift giving day (like maybe hunt down the pony to give them their gift or something safer )? Not sure if this is answered somewhere else...I couldn't find it anywhere...but who are the members of P.O.N.I? Though Even and Word I think would consider themselves more 'helpers' than actual event organizers. Now also regarding the Hearthswarming Helper. Tomorrow is the day I will be handing out your names so please please please if you want to be included let me or one of the ponies above know somehow. I will either Discord message or PM you on here with your pony. Then the actual gift exchange party will be held on the 22nd at a time TBD. Thanks. However there are big things in the works. Very soon, there will be an official announcement for the EQUESTRIA WINTER GAMES. Also there are some birthday parties coming up. Has it been determined when Frisktaker's birthday party will start? Also, is there anything I need to know about how these parties work? Do I need to prepare anything? It is the first party I plan to attend. If I don't read anything, I'll assume that the party starts at 9PM GMT. Also, is the location of the party already planned? EVERYPONY LISTEN UP! THERE ARE TWO HUGE EVENTS COMING SOON! 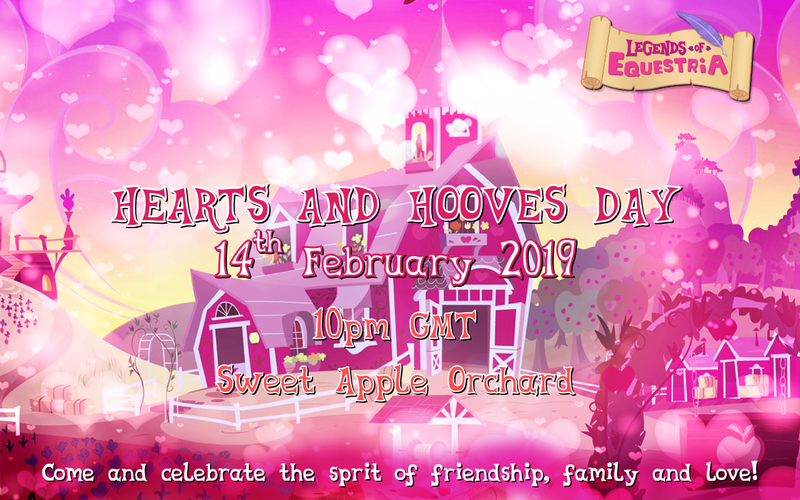 Hearts N Hooves Day Celebration! Starting times for these events have not been determined yet. There will be an early and a later session for most and you will be given the chance to vote on the times that work best for you and your team! See below for the rules and routes for each events. Inquire with these ponies about joining one of their teams or feel free to start your own. The more healthy competition the better! And now the information about each event. Please ask a member of PONI if you have any questions or would like to see any changes made. 1. Divide groups by race, so only earth ponies race earth ponies, etc. 2. Racers start at Evershade, race to mines, turn, and come back. 3. 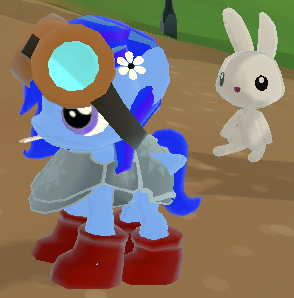 Can use either type of skates, teams can share enchanted skates if they have them available. 4. No flight, teleportation, or running on the banks. Ponies will be stationed along the river to prevent cheating. 5. Trafficcorns will be stationed to keep ponies from going down side path. 6. Ponies will earn 1, 2, 3 place by race (pony type). 7. Can do a race with everypony at the end if there is time available. 1. Race will begin and end by a Ponydale train station. 2. Participants must be Pegasi. 3. Racers must fly for the whole route, taking energy breaks as needed. 4. Trafficorns will be stationed along route to observe. 1. Event will begin/end at Ponydale Town Hall. 2. Teams will be given a list of items to find and must obtain them either from battling mobs or buying from vendors (npc or pc) within the time limit. 3. Teams can divide their resources to efficiently gather items. 4. The theme of the hunt will be objects needed to build a snow pony. 5. Getting stored items from banks is not allowed. Trafficorns will be stationed at each bank to prevent the use of them. If a pony is caught using the bank they will be disqualified. 6. To finish the race, teams will trade their gathered items to a designated snow pony who will wear the wearable items. 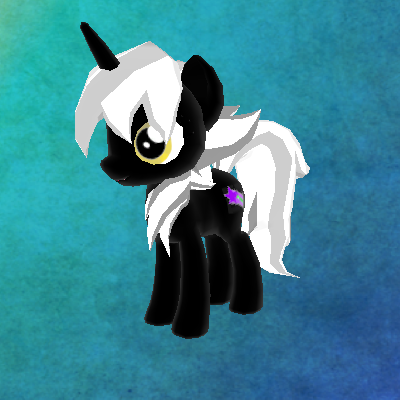 The snow pony will be a volunteer from the crowd or a member of PONI. 7. Extra points will be given for bonus items within the theme. 1. All participants must be foals, can make a foal version of your adult pony to participate. 2. Event will take place on Ponydale river by fishing pier. Ponies must start on the ice and run towards pier, sitting as they pass the pier. 3. A referee will stand on the pier, anypony who does not sit in time will be told to start over. There will be some leniency with this so don't worry. 4. Judges will be on hoof to judge the participants by how far they slide and how cute their costumes are so be sure to wear your cutest foal costumes. 5. If skates are needed they will be supplied either by event officials or by your team. 1. Teams must consist of two Pegasi and a third pony of any race. There can be multiple teams from one larger team participating. 2. Race will be held at the Cloudopolis Cloudoseum. The racers need to get from the bottom to the top of the stadium. 3. The goal is for the Pegasi to create platforms to get the third pony up to the platform from the ground. 4. Teams that reach the platform 1, 2, 3 will receive points. 5. If the pony falls, the team starts over from the ground. THESE RULES ARE SUBJECT TO CHANGE> PLEASE ASK IF YOU HAVE QUESTIONS. Finally, PONI needs your help. If you don't plan on participating in the Games consider volunteering to be a Trafficorn and help enforce the rules or be a volunteer judge and help judge some events. Please let a member of PONI know if you're interested. We hope everypony will enjoy these exciting upcoming events! The Winter Equestria Games need your help. We need to be able to hold the Games, but in order to do that we need to know what times will be the best for the ponies who want to participate and watch the Games. Please vote in the following poll for the best times to hold the earlier and later session. Please vote ASAP so we can set these times up! Equestria Winter Games Event Times!